In preparation for your final OpEd project, this blog post will help you draft a working introduction of your primary text, and two paragraphs of linked close reading. We will then use Tuesday’s class as a workshop to review and revise this draft material, for inclusion in your final project. For this post, you only need to follow the instructions listed below – please ignore the typical blog post structure and word count. Summarize the text’s content/form: Outline specific aspects of its structure & content including: form, genre, length, characters, events, images, narratives, relationships, etc. Be specific. Briefly situate this text within your selected topic: What should your reader know at the outset about the national, racial, cultural, and/or political contexts from which this text emerges? Give the reader just a brief sense of this context; more specifics about these contexts will be woven into the body of your OpEd. You may use revised material from your source mapping essay, but this material must be carefully linked to your intro of your selected literary text. Provide at least a few sentences that situate the reader within the text and within the scene/quote you want to close read. These sentences should lead into a framed, cohesive, and fluid quote. Then, focus on just 1 specific literary device within this quote. Identify it, and then analyze WHAT EFFECTS it produces, and HOW it produces these effects. Your answers to the WHAT and HOW questions must make reference to at least 1 other literary device/pattern within the quote. Your close reading should extend into a total of two linked paragraphs that also include a compelling answer to WHY these devices matter. Categorize your post in the “OpEd: First Draft” section. Include the blog post number at the end of your post. Include an image of your primary text or the selected author, with a caption. Use in-text citations and a correctly formatted Works Cited list. Your comment should make a specific suggestion for how your peer might expand their close reading, through attention to another literary device within their selected quote. Alternatively, you might note additional effects tied to the literary devices that your peer has begun to analyze in their post. Create a Word document version of your post to use during our in-class workshop. This version should include the entire text of the post (no images) and must also include a separate Works Cited page. Bring a laptop/tablet with you to Tuesday’s class (4/23) with this Word document on it, so that comments and revisions can be made directly to the document. Identify one central argument that Daniel Goh and Philip Holden make about how race and multiculturalism function in Malaysia and/or Singapore. Summarize this argument using a combination of paraphrasing and direct quotations (framed in complete sentences). Then, describe what you find interesting, revealing, or strange about this aspect of Malaysia or Singapore’s multicultural context. Consider, for example, compelling similarities and/or differences to the US / UK contexts we’ve studied thus far. Alternatively, you might discuss how their explanation of these countries’ racial dynamics clarifies or illuminates wider global contexts surrounding theories of race and multiculturalism. Introduce 1 visual pattern that you notice within the first 96 pages of Vietnamerica and which you find compelling. It can be any kind of visual pattern: a recurring image, a particular use of color, a combination of blank / filled space, the framing of a particular image, a link between different panels, etc. Describe the pattern and explain why you find it so interesting. Consider the following guiding questions: What effects does this pattern produce? How is this pattern reproduced / reimagined within the text? What connections does it call to mind? What does it make you notice within the graphic novel? What is its relationship to the written text within the graphic novel. How does Kamila Shamsie illustrate the intersection of British and Muslim identities in the first of half of her novel, Home Fire (2017)? In this blog post, you will provide one specific answer to this question through a close reading of one character of your choice from the first 183 pages of the novel. Focus on just 1 scene involving this character and close read 1 literary device within that scene to develop your answer. Follow the steps below closely, and be sure to also refer to the Blog Post & Blog Comment assignment sheets as you draft and revise your post and comment. 1. Following your opening hook, introduce the novel & selected character. Provide key publication details for the novel including the author’s full name, novel title (in italics), and year or publication (in parentheses). Briefly summarize the novel’s first 183 pages, and then introduce the specific character you will analyze in this post. Provide concise, specific, details for both the novel and this character. 2. In the body of your post, introduce the scene and quote you will analyze that centers around this character. Provide enough context for the scene and quote that it makes sense to someone who has not read the novel. 3. Describe what specific effects this device produces. What associations, implications, connotations, or connections emerge from this device and surrounding elements within the text? What do these effects reveal about this character and the intersection of their British and Muslim identity? You will need to re-quote / reference specific elements of the text in this portion of your close reading. 4. Explain how the device produce these effects. What lead you to notice these associations, implications, connotations, or connections? What body of images, images, and meanings are you drawing on in order to suggest these effects? How do these effects illuminate the intersection of this character’s British and Muslim identity? Again, re-quote / reference portions of the text as needed to illustrate your claims. 5. Detail the significance of these effects to your unique answer to this post’s central question. In other words, why do these effects and this literary device matter to your understanding of this character’s British & Muslim identity? Be specific and avoid vague statements and cliches. This post is designed to get you flexing your close reading muscles ! Here, you’ll provide a detailed close reading of one specific literary device in one of the assigned poems from Claudia Rankine’s collection, Citizen: An American Lyric (2014). Use the steps detailed below to develop a fluid and cohesive argument about the significance of this literary device within the selected poem. Introduce the selected poem. Remember to include key publication details: poem title in quotation marks, author’s first and last name, the full collection title in italics, and the year of publication (see how I’ve done some of this above). Alliteration, consonance, internal rhymes, recurring patterns, and/or other poetic devices. The structure of sentences, words, and/or images (remember to clearly identify these). Frame a cohesive quote illustrating the selected literary device. Remember to provide enough context to situate your reader within the relevant section of the text. Describe what specific effects this device produces. What associations, implications, connotations, or connections emerge from this device and surrounding elements within the text? You will need to re-quote / reference specific elements of the text in this portion of your close reading. Explain how the device produce these effects. What lead you to notice these associations, implications, connotations, or connections? What body of images, images, and meanings are you drawing on in order to suggest these effects? Again, re-quote / reference portions of the text as needed to illustrate your claims. Explain why these effects are significant to your understanding of the poem. In other words, what do these effects convey about the poem’s content or form? What do they reveal? What do they draw our attention to? In this first blog post, I’d like you to summarize and analyze 2 specific ideas about race/multiculturalism that emerge from 2 different secondary sources that were assigned between 1/24-1/31. You can choose any combination of the following: Ali Rattansi’s Multiculturalism: A Very Short Introduction, Ijeoma Oluo’s So You Want to Talk About Race, Michael Omi & Howard Winant’s Racial Formation, and the Seeing White episodes. Introduce each source with key publication information – the full name of author/hosts, chapter/book/episode titles, and year of publication. Summarize one key idea from each source, using a combination of direct quotations and paraphrasing. Then, reflect on and analyze these two ideas by (a) describing what you find useful, compelling, or revealing about each idea and (b) explaining how you see these two ideas connecting, contrasting, paralleling, or diverging from one another. In other words, trace linkages of different kinds between the two ideas to illuminate how/why you they are so compelling. Remember to follow the structure and format requirements as detailed in the Blog Post Assignment Sheet. I’d also encourage you to check out this example of a thoughtful and effective blog post by a student in one of my previous courses. I have a confession to make. I don’t really think of myself as a creative or vibrant writer. In fact, I consider my writing pretty ordinary. By contrast, I’m in awe of the lyrical and seemingly effortless writing of my friends and colleagues. At times, this assessment of my own writing can stop me in my tracks – it makes writing seem almost impossible and it saps all the joy from the act and art of writing. Does this sound at all familiar to you? I’m guessing it does because I think we’ve all been there – either at some point in time or on a fairly regular basis. 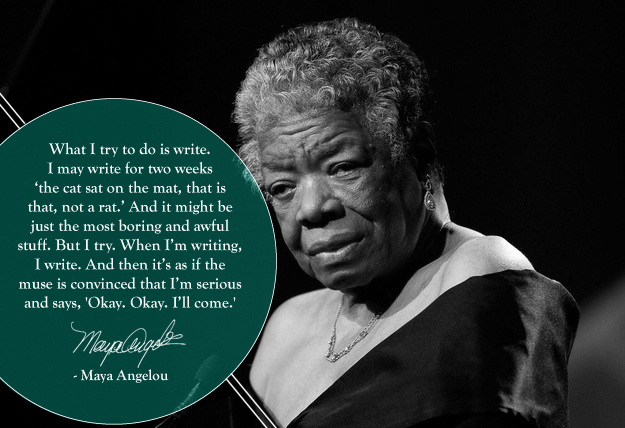 But, as Maya Angelou explains, we need to try to write…even if it’s “the most boring and awful stuff.” And so here, on our course blog for ENGL 221, you’ll all engage regularly in this practice of writing. This will be an ongoing and collaborative effort to move past the “boring and awful stuff” in order to find your muse, develop your voice, and expand your ideas. Throughout the semester, you are responsible for uploading 6 posts (300-400 words each). Each post will offer a polished, focused response to a specific prompt, based on one of the assigned primary or secondary texts (prompts will be posted here as well). These short writing assignments will help you develop ideas and arguments for in-class discussions and upcoming course assignments, while also honing your critical thinking and writing skills. For each week that a blog post is due, you will also upload one comment (150-250 words) in response to a peer’s post. Unless otherwise specified, blog posts are due on Fridays by 5pm, and comments are due by Mondays at 5pm. Refer to the blog post and blog comment assignment sheets (uploaded to Moodle) for details on the assignment requirements and how they will be graded. At its core, your blog post should develop an interesting and original response to the assigned prompt. Close reading of the assigned text should be detailed, specific, nuanced, and creative. Let your voice flow freely, but be sure to cite and analyze specific quotes from the assigned text. Focus on developing clear and fluid sentences, effective and creative transitions, and use at least one image or gif to amplify your ideas. Remember that this is a space in which we’ll be collectively developing clear, vibrant, and analytical writing. In order to do so, we need to keep in mind that writing is a labor, a practice, and an art! It is also the medium through which we will think carefully and critically about multiculturalism.